I had planned to write yesterday’s post after putting Kaya to bed, but I hadn’t planned in falling asleep with him! I woke up a few times in the night wondering groggily what time it might be before konking out again. I guess I was tired. Anyway, I’m back again and I wanted to share one quick glimpse of another market. 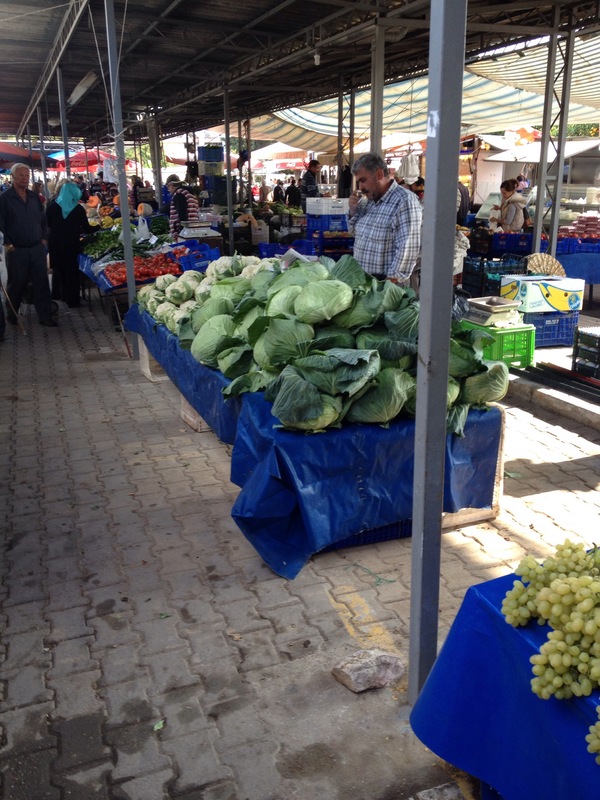 On Monday, Ali and I headed out to the garden together and on our way we stopped at the weekly market in Kemer. Kemer is a mid-sized town halfway between central Antalya and our garden. It is a very pretty place, but I find it a bit depressing because its whole existence is centered on tourism. There is, to me, an air of desperate interest in anyone from out of town in a place like that, and I prefer places where everyone is too busy going about their business to pay me much mind. Still, they’ve got a fantastic market. I took this one photo as I neared a table piled high with appetizing cabbages (my current vegetable obsession, though pumpkins are a very close second these days) and I heard Ali start to mutter. I’m used to marketing on my own, so much so that I felt quite excited that we were out together in a market day; it felt like a real outing. So to keep the peace, I didn’t shoot any more pictures as we shopped. We got two lovely sea bass for lunch, though, so I felt quite richly rewarded for our trip to the market. To be sure! It’s sometimes best to just avoid the fuss… I would be over the moon to have a cabbage that size in my garden. Mine are measly by comparison. I usually grow Savoy cabbages though and I swear they expand when you cut them up, like those sponges that grow in the water. Look at those cabbages – wow, just think how many meals you’d get out of one of them! Gee. I’d probably be one of those tourists the market is intended for. I always go to the markets when I’m in another country. I rarely buy anything but I sure do like to look around and see the variety available. One of those cabbages would last me a few meals. They’re huge!